This on-line 'game', Reduce the Federal Deficit, just came out from the Concord Coalition, a group that has been dedicated to balancing the budget since before it was cool and deadly essential in today's world. With all due respect to aficionados of other on-line games such as Angry Birds, Farmville and Scrabble, this might be the most important on-line game you ever play. 2) The more registered voters in America who will take what they learn on this game and then contact their elected representative or senators to tell them what to do based on this 'game', the higher the degree of chance they might actually do something in the lame-duck session that is coming up after the election. Such as: pass Bowles-Simpson; fix the fiscal cliff, re-pass and re-institute the PAYGO budget mechanism that worked so well during the last (and only) decade when we ran balanced budgets, the late 1990's...that sort of thing. Based on what we have seen over these past 12 years, we think a room full of chimpanzees typing away randomly on a computer keyboard actually has a higher probability of balancing the budget than our current elected leaders in Congress and the White House. 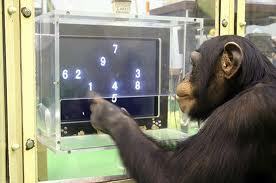 Because there is actually the slim chance that the chimpanzee budget committee will do so by random chance. There has been zero probability with the humans now in office over the last 12 years, hasn't there? We took the test and balanced the budget in 4 years or so and ran a $4.7 trillion surplus by year 10 which would be used to pay down at least the debt incurred over these past four dismal years. Take the test and then post your 'scores' in the comment section below. It is not 'rocket science, you know. I "scored" a 1.1T surplus. However, to do that I needed to allow the tax breaks to expire, which I consider undesirable (but I didn't have the option to indicate where I would compensate for it otherwise). Also, I didn't pick any reforms to Social Security, because my preferred reform (which fixes the problem entirely) wasn't an option. That, in general, is the problem with surveys like this: they fail to capture many of the preferred reforms that people might have, and force limited choices. The problem with limited choices is that, given multiple bad options, people tend to not pick any of them, leading to the status quo (or worse). That is, the budget balancing problem in a nutshell. Congress hasn't done that in over 15 years.